As you probably figured out from my post that talked about the Helsinki Airport Book Swap, I was back in the homeland for the summer again. My two months in Finland went by fast, much in the same fashion as my previous year’s summer break in the Great White North. But now I’m in New York again, ready for new adventures and mind-opening encounters. I already had one of those on Sunday at Union Square, when I spotted Pablo Garcia, the Argentine man behind the World By Bike project. He has been cycling around the world since 1999! 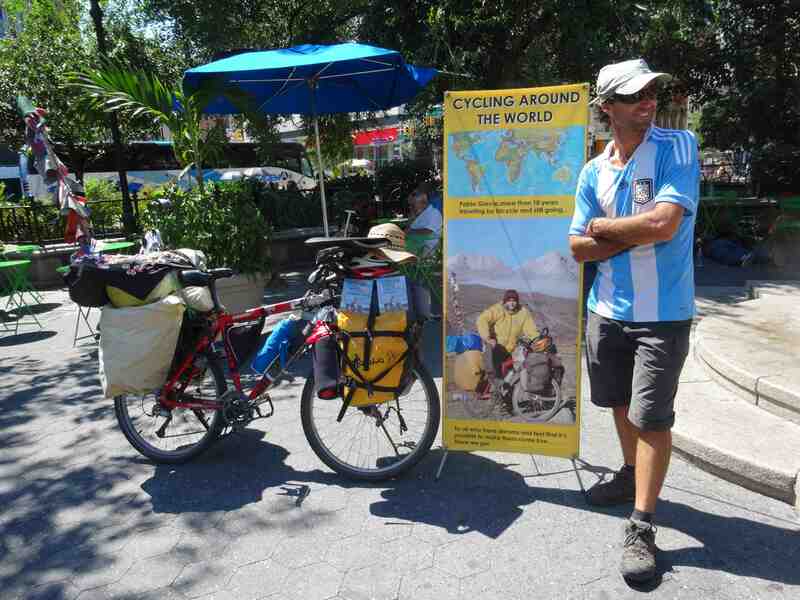 Pablo was at the square with his trusty bicycle and a banner explaining his journey that has taken him through 82 countries. He was selling doll pins for $5 and a $15 DVD documentary of his travels, which is how he finances his trip (along with sponsorships). The final stage of his round-the-world trip, biking back to Argentina, is expected to take about two years. By that point he will have cycled for 16 years, and visited every continent sans Antarctica (makes my own travels in 60+ countries by public transportation seem measly by comparison!). I had just seen the “World By Bike” documentary the day before as my friend had bought it from Pablo at Union Square, so it was great meeting its star in real life. While the quality of the film isn’t quite on par with National Geographic documentaries and the like, it’s pretty good considering the challenging shooting surroundings (like the extremely hot Himalayan mountains and mosquito-filled Yukon territory of Canada). The story itself is truly fascinating and keeps you glued to the set for the whole 48-minute duration. An integral part of the doc is a bittersweet love story with an Italian girl Clara who comes along for a year of cycling but then decides life on the road is too much for her. If you are interested in buying the documentary and supporting Pablo’s amazing travels, you can do so here. Here’s the trailer of the documentary, one that Pablo told me is just the beginning. Once back in Argentina, he plans to do a whole series of films about his epic journey. Looking forward to seeing them!